DETROIT, Dec. 22, 2017 /PRNewswire/ -- As another blast of frigid weather approaches Michigan, DTE Energy customers have peace of mind that the state's largest energy company continues to improve the safety and reliability of its natural gas delivery system, ensuring ample heat for homes and businesses this winter. Over the last five years, DTE, Michigan's largest energy company, has upgraded more than 2,100 miles of gas lines - enough to stretch from Detroit to Sault Ste. Marie six times - and installed thousands of advanced meters through its Gas Renewal Program. This planned, deliberate work allows the company to improve infrastructure at a time when natural gas prices continue to fall, keeping overall energy costs affordable for customers. That's good news, heading into the cold winter months when temperatures drop and natural gas usage rises. Mark Stiers, president and COO, DTE Gas, compares the work to the efforts of owning a vehicle. "When you buy a car or truck, you maintain it to get the most of your investment. The same is true of our natural gas infrastructure that's served our customers very well," Stiers explained. "We diligently monitor and maintain our delivery system and make repairs when necessary. At some point, however, we need to replace sections of our system to ensure the reliable and cost effective delivery of energy to homes and businesses every day." Installed more than a mile of new main in Petoskey to accommodate the energy needs of a growing population in southern Emmet County. Because of this work, today more than 1,100 potential customers now have access to natural gas from main pipeline extensions in areas near Big Rapids, Traverse City, Petoskey and Grand Rapids. "These infrastructure investments not only keep natural gas delivery reliable, they are also beneficial to local economies," said Stiers. "Overall, the effort employs more than 300 people - either directly by DTE or though Michigan-based companies - and invests $60 million in contactors, engineers and restoration teams." While DTE employees have conducted this work, they earned the American Gas Association's Safety Achievement Award for excellence in employee safety the past two years. From a modern control room, DTE gas controllers analyze a constant flow of data 24/7/365 from more than 4,500 points along the system. Changes in pressure and other information are transmitted from pipeline sensors to computers and telemetry equipment in the control room that display the information to the controllers. Should the need arise, within minutes, controllers can close any of the more than 140 remote-control valves to shut the flow of gas at key locations in the pipeline system. DTE also performs routine inspections inside major pipeline sections, using a self-contained electronic device. This device emits a strong magnetic field to detect anomalies inside the pipe and is pushed through the gas system while recording detailed data about the condition of the line. Above the system, aerial surveys are conducted twice a month of the company's 2,200 miles of transmission lines. 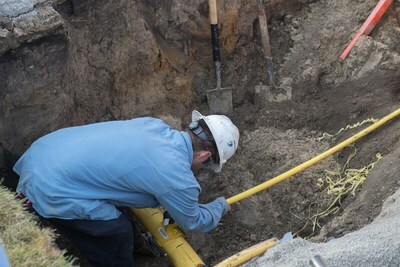 An employee of DTE Energy's Gas Renewal Program team attaches a new service line from a customer's home to a new main pipeline.